The Nomadic Boys (Stefan Arestis and Sebastien Chaneac) released this fun travel video diary of their recent trip to Indonesia. It features their favorite moments in Flores, Lombok, the Gilis and Bali islands. We started exploring the beautiful islands of the Komodo National Park, which has some beautiful secluded beaches, THE BEST scuba diving we have ever experienced and of course the famous Komodo Dragons. On Lombok island we trekked up to the Rinjani volcano and enjoyed the rainforest jungle scenery in the Rinjani National Park, including the Sindang and Tiu Kelep Waterfalls. During our trek up the mountain we camped at the crater rim of the Rinjani volcano enjoying some spectacular views, particularly at sunset and sunrise. 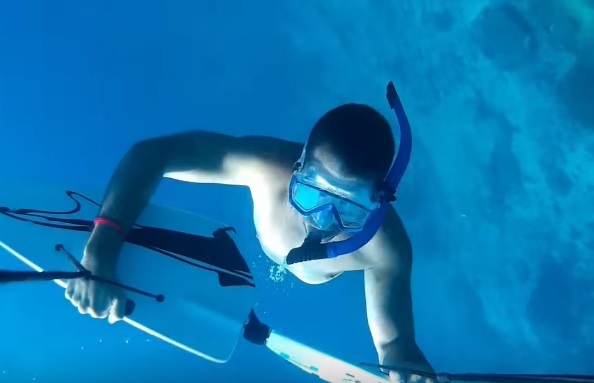 The Gili Islands just off Lombok are great for relaxation, partying, scuba diving, snorkelling and trying subwing (at 1:57) - a new way to experience the underwater world. Our favourite thing about travelling in Indonesia was the scuba diving. Diving in the Komodo National Park and around the Gili islands was just incredible! We saw reef sharks and turtles in almost every dive and at one stage in the Komodo National Park we saw 2 Moray Eels fighting. Bali island is great for the gay bars in Seminyak. Ubud in the centre of the island is a great base to discover the Hindu culture of the island. We also did an excellent cooking course in Ubud learning to cook Indonesian classic dishes like sayur urap and jagung. Sebastien Chaneac grew up in Lyon, France. Eventually Sebastien moved to London UK where he became an IT geek. Stefan Arestis was born and raised in London, where the two men met. The gay couple share their travel adventures on their official site. You can also follow Nomadic Boys on Twitter.